Beef tri-tips are a popular choice for cooks seeking a lean, boneless beef roast that still boasts delectable flavor. Available in sizes typically ranging from 2 1/2 to 6 pounds, the tri-tip makes an ideal cut for slicing into stir frys, cutting into steaks, barbecuing or roasting whole in the oven. Slow cooking a tri-tip in the oven helps keep the meat tender and flavorful without drying it out. 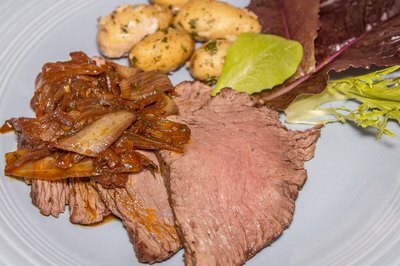 To slow-cook a whole tri-tip in a conventional oven, it is important to bake the roast at a relatively low temperature. Set the temperature between 250 to 325 degrees, depending on how slowly you'd like to cook the roast. The lower the baking temperature, the longer the tri-tip requires to cook. 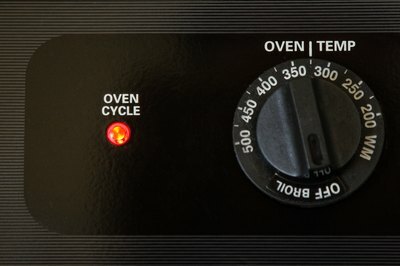 Base your oven's temperature on the amount of time that you have to cook, and the size of the roast. A tri-tip roast requires approximately 30 minutes per pound to cook, when baked at 325 degrees. However, using an oven heated to a lower temperature, such as 250 degrees, may require up to an additional 10 minutes per pound. 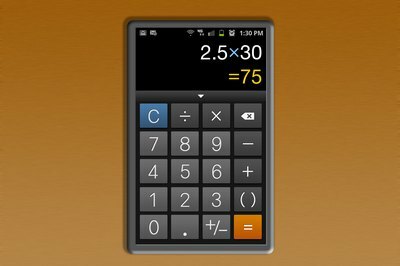 To ensure that your roast is cooked thoroughly, yet not overdone, calculate the estimated cook time by multiplying the weight of the roast by the estimated cook time per pound. 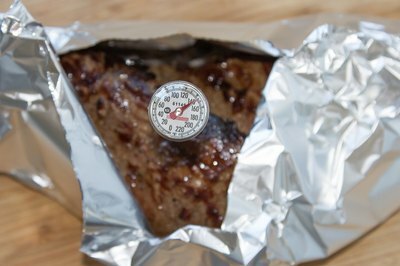 The best way to cook your beef thoroughly is by using a meat thermometer. Insert a meat thermometer into the thickest part of the tri-tip roast near the end of your estimated cook time. Look for a reading of 145 degrees for a rare roast, or 160 degrees for a medium cook. Ideally, try to remove the tri-tip at a temperature 10 degrees below your desired final temperature to avoid overcooking. 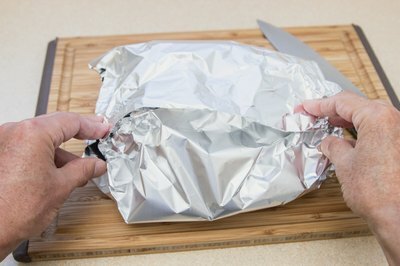 After slow-cooking a tri-tip roast, remove the piece of meat from the oven and cover the pan with a loose-fitting tent made of aluminum foil. Allow the roast to sit for no less than 15 minutes. The resting process allows the meat to continue to cook and reach your desired end temperature without drying out. Additionally, the natural juices of the meat continue to soak into the roast, as opposed to leaking out of cuts served immediately after removing the tri-tip from the oven. When choosing between brisket and tri-tips, decide how you plan to cook the meat and how many you hope to serve.